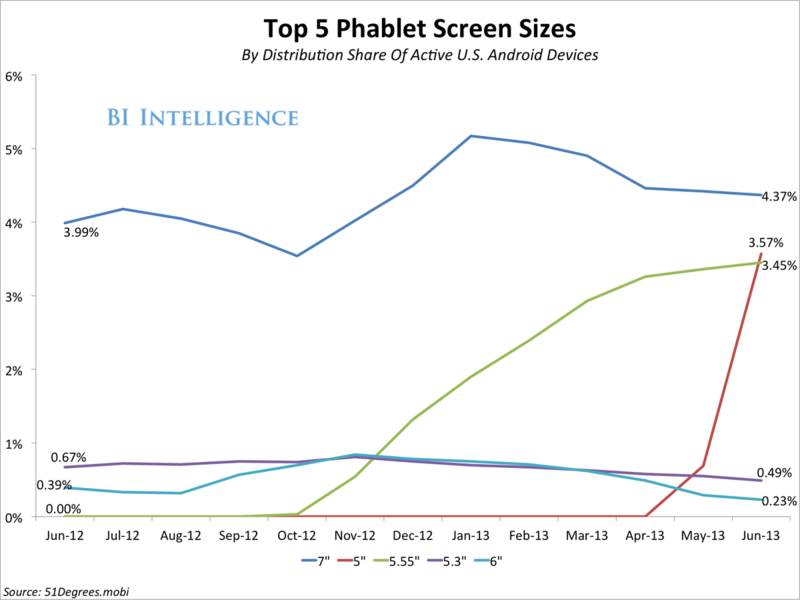 For further perspective, let’s look at trends in the phablet category. Here, we can see the quick rise of 5-inch and 5.55-inch phablet devices. Those screen sizes correspond to the Samsung Galaxy S4 and Samsung Galaxy Note II, respectively. Both devices are billed by Samsung as smartphones, although even some adult users find them too unwieldy to hold comfortably in one hand. These two Samsung products combine for just over 7% of the entire Android smartphone market, which is significantly greater than the share now held by smartphones with 3.2-inch screens. Samsung has clearly been the driver and the beneficiary of the trend toward larger screens in the Android smartphone world.